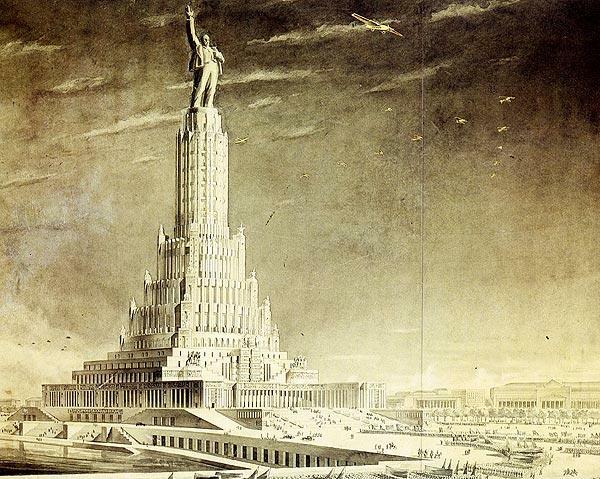 Architecture is often ideology written large, and these amazing plans for Soviet era buildings ( that were never built) seem as remote and chilling as Aztec temples – or are like some science fiction vision of alternative worlds, which is really what they were. More of them can be found on this amazing site, which I’ve relied on almost exclusively for the descriptive info about each one…. 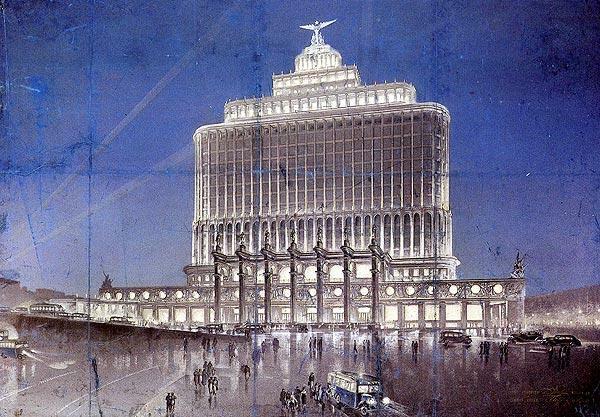 The idea here was to construct a building which could be a symbol of the “imminent triumph of communism” situated in the capital city of the world’s first state of workers and peasants. 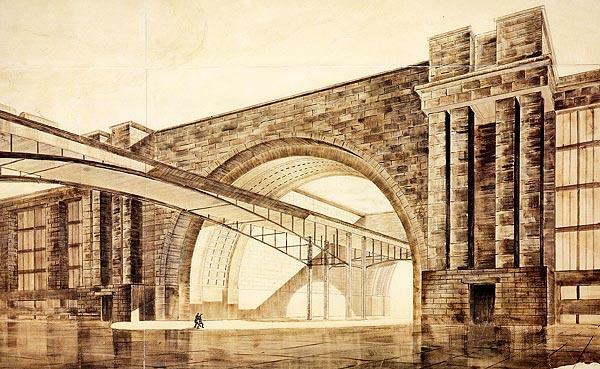 Some heavyweight foreign talent – eg Le Corbusier, Walter Gropius – submitted plans. The central idea was a building taller than the Empire State orthe Eiffel Tower, with a 100 metre statue of Lenin plonked on top. The project called for a complex of scientific and technical institutions at a time of centrally planned industrialization which, the website says (quoting from the brief) was to “arm the masses with the achievements of Soviet industrial technology, agriculture, transport and communications”. From the website : “In 1934, the attention of the whole world was focused on the fate of the crewmen of the ice-breaker “Chelyuskin”, who were adrift on an ice-floe after the ship went down in the Sea of Chukotsk. In the summer of the same year Moscow greeted the courageous survivors and the pilots who had rescued them, and who were the first to be granted the “Hero of the Soviet Union” award. The new traditions of socialist life demanded the perpetuation of the memory of this outstanding feat in monumental form. Hence this “Aeroflot” building, intended as a monument to the glory of Soviet aviation – with the sculpted figures of the heroic airmen A. Lyapidevsky, S. Levanevsky, V. Mîlîkîv, N. Kamanin, M. Slepnev, M. Vodopyanov, I. Doronin, crowning seven openwork arches, perpendicular to the main facade and comprising a distinctive portal. The result of a competition for a monument to the heroes of the Great Patriotic war against Hitler, and intended for Red Square. 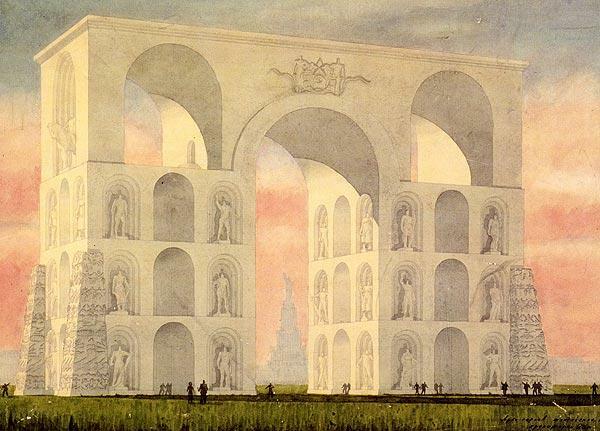 Finally, no account of crazily grandiose unbuilt buildings can be complete without something by Paolo Soleri (born 1919) – who conceived of a whole series of mega-huge structures to be built on land and on the sea, housing millions of people in the one building. I used to own a book of Soleri’s sketches, and even the book was enormous and could only be read by laying it down on the floor. The common theme of all the various ‘arcologies’ that Soleri designed was to conserve energy and resources, and to try and recreate the communal life of pre-industrial European cities in the one immense place ..or if you prefer, in the teeming beehive. 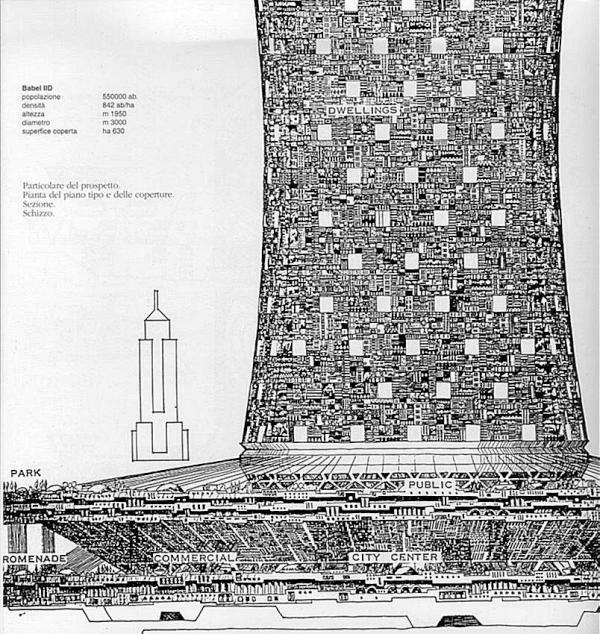 For an idea of the scale, the little sketch to the left of the main design is the Empire State Building.